I don’t know that I would always call the holidays magical. I think for a lot of people it adds stress and anxiety. Maybe some additional time with the family? Father Brian used to say his family put the “fun” in dysfunctional..lol.. I’m sure some of you can relate. But seriously, the holidays can add extra stress – or they can be an excellent way for your brain to rationalize the celebrations you should be experiencing. And in both cases extra alcohol may be the answer. But then that usually leaves you either not sleeping well, or waking up foggy and not as productive as maybe you want to be during these next couple of weeks. Maybe this year though you are hoping for something a little different. OK – hold your roll. Before we go too far. That does sound lovely doesn’t it? I hope this year will be different. But hope can be a problem. You might be saying – to be honest the first time I hear this concept I thought my coach was off her rocker. I though hope seemed so… magical – lol… guess that is my word for the day. We’ve discussed in previous episodes how our actions are always driven by our feelings. Take a moment and tell me how “hope” feels. Like – I hope I lose those last pesky pounds, I hope I can stick to my drink plan, I hope my business does well. Hope really doesn’t assign responsibility to you. It is like – let me put it out there and dream about it…. But does that actually inspire action? Do they still have those things? Now – think about how you feel if you say you are commited, or determined to make this year different. Now your talking about taking responsibility…. Getting something done. This is a concept not just for your goal to drink less. 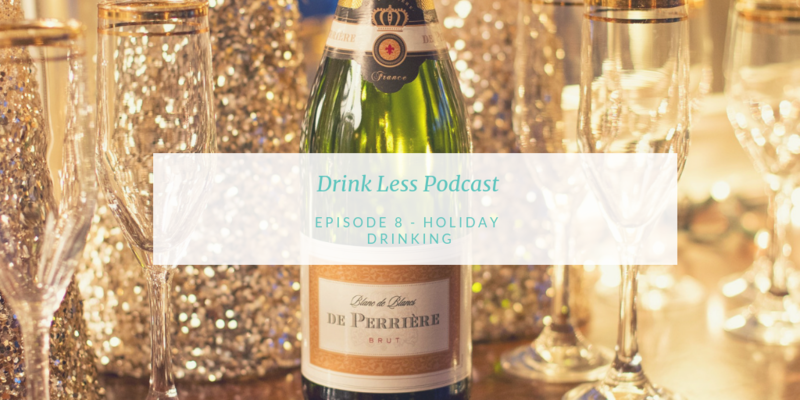 But let me tell you – when you show yourself you do what you are committed to – say drinking less during the holidays – then you start experimenting with other aspects of your life. So I’m currently in the thick of this work with my business. I feel confident about the work I’ve done with the drinking less – and now I have to not just “hope” my business continues to do well – I have to be committed to ensuring it is successful. I love watching the clients in my one on one program make these shifts and start believing they can do more than they ever imagined with the tools we use here. Speaking of tools. I have one for you today. You should get out a pen and paper to take some notes. Well – not if you are driving..lol. I’m sure you’ve heard of “cheat days” for eating. I actually prefer to call them “exception days”.. like you are making an exception – cheating just sounds.. I don’t know – like bad. Exception is more planned out and thought about.. more mindful. So that’s what we are doing for our drinking over the next couple of weeks. Before you head to your next holiday gathering I encourage you to take the time to really consider the situation. Now – you have your normal drink plan. But let’s say you have a work or family party to attend. Use this too whether you think your normally head to the extra alcohol because of stress or because you want to have “fun”. Do this work 24 hours in advance. Again – you want to be making decisions from your pre frontal cortex – not just reacting in the moment. First – decide if you are making an exception. Next – Why are you making the exception? This will bring awareness and also show you are in control. And be honest – it could totally be I want to drink wine and enjoy the buffer of not feelings so stressed out with all the family and kids and crazy going on around me. Next – What is your action plan on the exception day? It could be something like -I will have a total of 4 glasses of wine at the party max. Maybe something like I will feel terrible in the morning, likely not sleep well, and that’s ok. I will drink a lot of water the next day and stop drinking early so it doesn’t effect me too much the next day. Doing this work is an important key to de-conditioning the desire to over drink. Remember – you want to take the time to write it down. It is so much more powerful to see on paper. I just witnessed this again myself as I was self-coaching on some business topics. I thought I had it down in my head but once my coach required we write it down and submit I was like WOAH – where did those thoughts come from? Lol..
Did you know I also offer free coaching each week? I have limited spots but it is a great way to see learn more about how coaching could help you specifically. Best way to get started is to head to mindfulweighs.com/freebie – you can download the free guide on how to drink less tonight and get on my email list for additional free content and notifications.